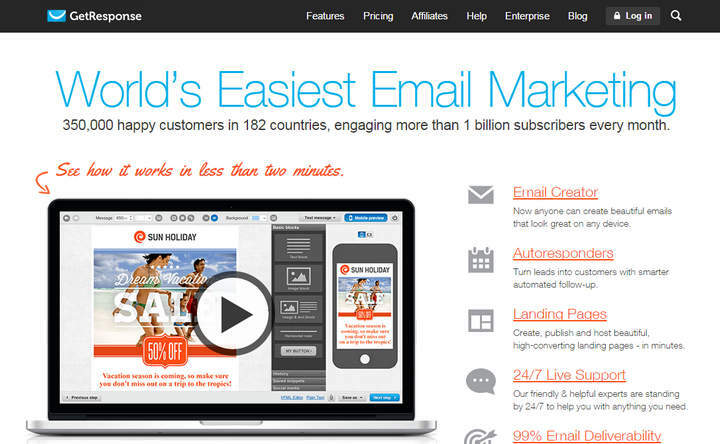 Get Response is a feature-rich email marketing and autoresponder service. This service lets you create fully responsive emails and landing pages within a short period of time. If you have got an email list already, you can easily import the list to your account. The unique inbox preview feature enables you to preview how the email will look in the visitor’s inbox. You can create 5 different versions of your emails and check their individual performances. The dedicated mobile apps allow you to manage your campaigns from any place. Let’s take a quick look at the pros and cons of GetResponse. GetResponse offers lots of pricing plans, 7 to be exact. Let’s see what they have to offer. Pricing Plan 1: $15 per month. Allows up to 1,000 subscribers. Pricing Plan 2: $25 per month. Allows up to 2,500 subscribers. Pricing Plan 3: $45 per month. Allows up to 5,000 subscribers. Pricing Plan 4: $65 per month. Allows up to 10,000 subscribers. Pricing Plan 5: $145 per month. Allows up to 25,000 subscribers. Pricing Plan 6: $250 per month. Allows up to 50,000 subscribers. Pricing Plan 7: $450 per month. Allows up to 100,000 subscribers. With its simple user interface and the helpful video tutorials, GetResponse could be an excellent choice for the beginners. Advanced users will be pleased with the template library and third-party integrations. However, the WYSIWYG editor for editing the email and landing page templates is not very smooth. If you want to do a lot of customization, you should start with the trial first. Some popular alternatives to GetResponse include AWeber, MailChimp, Mad Mini etc. GetResponse could be a great tool to start and monitor your email marketing campaign. The intuitive system lets you create emails containing links, video and social networking buttons. However, before taking the final decision, get the trial first and see for yourself.